Three teen geniuses from diverse backgrounds must work together to stop a vicious warlord, protect their families, and save the world in this fast-paced sequel to Genius: The Game. Tunde: This fourteen-year-old self-taught engineering genius from Nigeria is in a race against time to save his village from a ruthless warlord. Painted Wolf: This mysterious sixteen-year-old activist blogger and strategist from China is searching for a way to rescue her father from the corruption he's inadvertently been caught up in. Rex: This sixteen-year-old Mexican-American has proven himself to be one of the best programmers in the world, only to be falsely accused of stealing billions of government secrets for the terrorist hacking group Terminal. 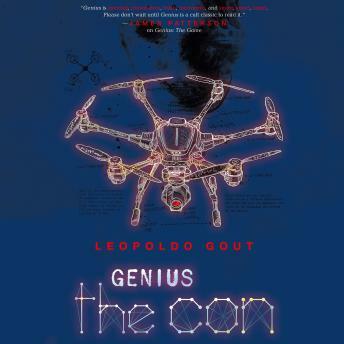 Pursued by the police, the FBI, and most dangerous of all, Kiran Biswas, visionary CEO and evil mastermind, three teen geniuses have to move fast and stay low as they race to find a missing brother, stop a vicious warlord, and save the world in Genius: The Con by Leopoldo Gout.